Contributed by authors who write from various disciplinary perspectives, the essays in this book clarify the learning theories of Mikhail Bakhtin and address the application of his concepts to contemporary issues. In addition, the authors are joined by other scholars in a Bakhtinian dialogue. 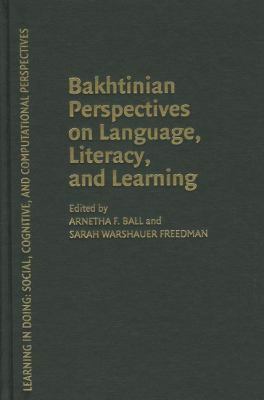 Together, they address questions that readers may have about Bakhtinian theory and its application to everyday teaching practices. Arnetha F. Ball is Associate Professor of Education at Stanford University. Her research interests focus on the oral and written literacies of culturally and linguistically diverse populations in the United States and South Africa. She has served on many boards and committees in her field and has published widely, with numerous book chapters and articles in journals that include Linguistics and Education, Applied Behavioral Science Review, Language Variation and Change, and Written Communication. Sarah Warshauer Freedman is Professor of Education and the Study of Writing at the University of California, Berkeley. John Seely Brown is Former Chief Scientist, Xerox Corp and former director of its Palo AltoResearch Center (PARC), and co-author of The Social Life of Information.